Fire destroyed entire pier and hundreds of yards of dock but ConVault Tank (bottom left of the picture) performed as expected. Natural disasters, acts of vandalism and terrorism, fires and explosions are all major concerns for building and facility owners storing fuel on site. For above ground storage tanks (AST’s) the Underwriters Laboratory (UL) 2085 listing has long been recognized as the “gold standard” for design safety. UL 2085 listed tanks provide fire protection (they have been Fire tested at 2000 Degrees for 2 Hours), secondary containment and protection from vehicle and projectile impact. But are the performance standards in this listing an adequate benchmark for what may happen in the real world? Two recent incidents highlight the importance of having the added protection and security provided by a ConVault AST. Both events took place at Department of Homeland Security facilities. In each case the ConVault tank helped guard against catastrophic losses of property or life. 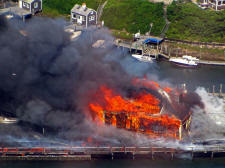 From Patrick Cassidy at the Cape Cod Times, “A massive blaze which completely destroyed a pier, boats, a service truck and a U.S. Coast Guard boathouse Monday afternoon at Menemsha Harbor on Martha’s Vineyard could have been worse. The marina fueling system supplied by Core Engineered Solutions included 500 and 1000 gallon ConVault tanks. The system was also equipped with an emergency shutoff switch and a remote dispenser with a thermal shutoff/fusible link valve. 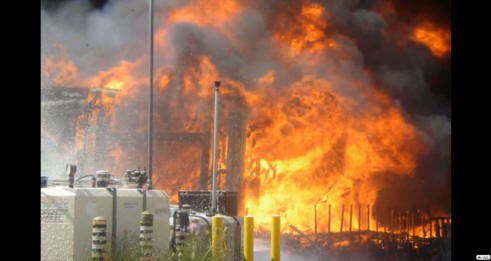 The huge fire which burned for 3 hours was only a few feet away from the ConVault tanks. The thermal protection of the concrete as well as the shutoff and fusible link valve prevented this fire from becoming an even larger catastrophe. The Coast Guard plans on putting the fuel tanks back into service shortly. ConVault AST’s carry the UL 2085 label but they step beyond the UL 2085 industry standard by offering added protection and performance verified by third party testing that is unmatched in the industry. ConVault tanks are designed with six inches of reinforced concrete protecting BOTH the primary and secondary containment. The benefits of this include added protection for your facility against catastrophic events including fire, ballistics, vehicle impact and vandalism. In addition, ConVault tanks are designed with reinforcing rebar surrounding both the primary and secondary containment. ConVault tanks have also been the subject of a Blast Effects Analysis designed to determine the inherent blast resistance of the tank design AND are the only ASTs to have received a Certificate of Developmental Testing and Evaluation Designation (DT&E) from the Department of Homeland Security under the Safety Act for approval as a Qualified Anti-Terrorism Technology (QATT). Karagozian & Case (K&C), a World Leader in Blast Consulting and Blast-Resistant Design, conducted this analysis in which three different threat scenarios were investigated to determine the inherent blast resistance of ConVault’s design for the tank. Scenarios were chosen to reflect blast safety distances recommended in FEMA’s Reference Manual to Mitigate Potential Terrorist Attacks against Buildings. The scenarios investigated were: a blast from a vapor cloud such as might accumulate at a refinery, a blast from 50 lbs of High Explosive (HE) TNT as might be carried by a typical suicide bomber, and a blast from 500 lbs of High Explosive (HE) TNT representing a typical car bomb. – Car Bomb (500 lbs. of Explosives at 20 ft. The tank passed all three tests. Overall, the BEA indicated that the ConVault AST is very resistant to the effects of the blast loads considered. The reinforced concrete vault is a key design feature. The mass provided by the concrete outer shell protects the steel tank and greatly enhances the resistance to all blasts. According to K&C the magnitude of these blasts at the respective proximities would be expected to destroy and/or relocate lighter, less robust fuel storage tanks. However, the ConVault AST will not only remain in place, it will survive with no fuel leakage from the primary tank. ConVault AST’s have been granted DT&E designation under the Safety Act for the Supporting Anti-Terrorism Technology. ConVault tanks are the only AST to have received this designation. The SAFETY Act is intended to provide critical incentives for the development and deployment of anti-terrorism technologies. Some things are just too important to cut corners. Fortunately, ConVault AST’s are manufactured to exceed even the highest industry standards for fuel storage systems. The combination of innovative design, thorough testing, and real world performance has earned ConVault the reputation of being engineered for the ultimate in safety and value and as a state-of-the-art, cost effective way to meet your storage needs. ConVault tanks are approved by virtually every fire and environmental authority in the US and Canada, and there are currently 32,000 in service at Fortune 500 companies, local, state, and federal government installations around the world. The question is not whether you can afford to buy a tank built as well as a ConVault. The question is whether you can afford not to.